I'm actually not much of a shopper, but I do always keep an open mind unless the shop I'm being dragged into happens to be filled to the brim with the kinds of knick knacks that can occupy the attention of the ladies for hours on end. I did get caught with my wife and youngest daughter a week ago in "downtown" Swansboro, NC. I had been told that it was highly unlikely that the shops would be open on a Sunday afternoon. Unfortunately that turned out to be completely wrong. They were practically all open, and I didn't see a single fishing reel. Somewhere along the way, we came to a store that had these funny looking shoes called "Crocs." I could vaguely remember my wife trying some on during the summer and telling me they were the latest things. So I wasn't too surpirsed when my wife, Glenda, decided to buy a bright red pair of Crocs. Of course that purchase decision required a significant amount of time so to keep my self busy, I tried on a pair. They actually felt pretty good. However, I quickly decided again taking the plunge on lime green Crocs. A few days later, we were in Roanoke at the local Birkenstock store. It turned out the Birkenstock store had more Crocs than Birkenstocks. Glenda and I both were hoping to find some new Birks. I didn't have much trouble finding some new Birkenstocks. 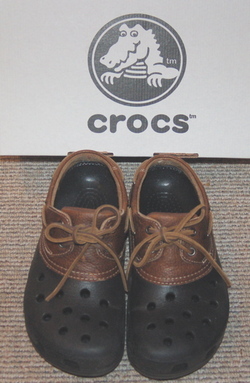 While I was waiting for Glenda to find out that she was going to have to wait for the next shipment to get the sandals she wanted, I noticed come Crocs that reminded me of a summer version of a Bean Boot converted into a slip on shoe. I tried on a pair and was immediately sold on them. The little bumps on the inside did a great job of massaging my old feet. Since I bought my Crocs, I've grown to really appreciate them. My feet seem cooler in them, and I have to say they are really comfortable. So if you are looking for some comfortable footwear, don't write off Crocs just because they're unconventional and come in weird colors. Last year, I wrote a post called "It's the footwear that defines you." I guess I'll have to amend the picture in the post and add my new Crocs. It's been bothering me that I left out my steel toed work boots anyway. I truly enjoy this man's positive perspective on life and living. There is good news to report and people want to hear good news! And this man can write, and I dare say speak, the English language the way it is meant to be written and spoken. Good job! I always look forward to reading your pieces. Well I always appreciate positive comments even from readers that I know. I won't let all the good stuff you're saying go to my head. So when are you going to come visit me on the coast? They are easy to clean. I wore them when plowing my garden. I just ran some water in them them to clean them out and then dried them.